No other remodeling project creates as much space, costs so much, or takes as much time as a house addition. Yet an addition seems to be the one house alteration that most people want, usually because they really need the extra space, and adding on allows them to stay in their current home rather than buying a bigger one. Most homeowners complete an addition by hiring a remodeling contractor or builder, but that doesn't mean the owners are hands-off. On the contrary; homeowners need to be involved with every step of the process to make informed decisions and ensure the work meets their expectations. 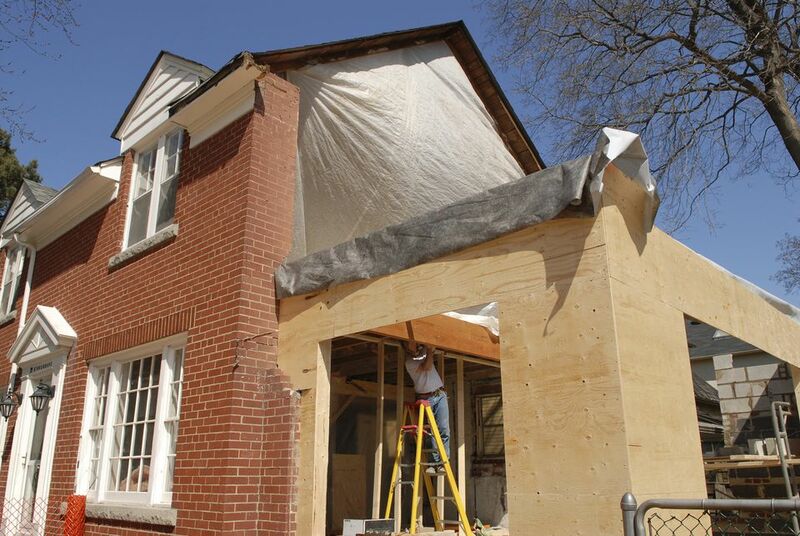 To prepare for a home addition, it can help to view to project as a giant step-by-step project. Specific building materials and tools to work with them vary from project to project, but as a general rule, home additions include most (if not all) of the same groups of materials that a new house requires. Know the scale of your project. A home addition is just like building a house and involves design, budgeting, permits, contractors and subcontractors, and building the structure from the ground up. It's important to be prepared for the work involved and to be realistic about your budget. While some homeowners report paying $50,000 to $75,000 for a full-scale, multi-room house addition, a more realistic number is probably in the low six figures. Most homeowners cannot pay for full additions in cash. Thus, a loan or line of credit is needed. This usually involves obtaining a home equity loan, second mortgage, or line of credit based on the amount of equity, or value, that their homes have. Everything hinges on finding a good contractor that you can work with. Get real, from-the-gut recommendations from neighbors, friends, or relatives. If they cannot recommend a contractor, lose your shyness and knock on the doors of homes that have recently had additions put on. The importance of the contractor cannot be underestimated. This job is too big for you to contract out on your own unless you have professional experience and ample time. The first meeting establishes the scale of the project, the contractor's timeframe, general design issues, and cost-saving issues. Know that you can ask the contractor about options for controlling costs during the process. This is your money, after all, and a huge chunk at that. The contractor will take a percentage of the gross costs. For example, with a $100,000 addition, a general contractor might charge 10 to 20 percent, resulting in a total cost of $110,000 to $120,000. While some contractors can design your addition or can work from stock addition plans, in many cases it's best to hire an architect. There is some value in going with an architect recommended by the contractor. With this arrangement, you have two parties who are accustomed to working with each other. However, if you're considering this arrangement, you should perform the same due diligence that you would when selecting an architect unrelated to the contractor. Your contractor will obtain permits and will be required to post the approved permits in a visible spot on your property. A crew will come and drop off a portable toilet, and perhaps put up a sign telling the world who is building your addition. To prepare the site, anything other than level, bare dirt will need to be demolished, removed, and graded. Obstructions will be removed, even trees (if permitted by your community). Fences will be temporarily taken down to allow heavy equipment to access the site. The addition will get a full-scale foundation, just like a new house. Depending on the plans, the crew will begin pouring a concrete slab or excavating for a crawlspace or basement, followed by pouring concrete footers and foundation walls. As soon as foundation concrete is cured, the floors, walls, and roof are framed. One day, you come home from work and, suddenly, your addition has two, three, or even four walls up! The framing—the home's skeletal structure—goes up fairly quickly. In some cases, some of the framing is even constructed off-site. At this point, you may feel like the project is just days from completion, though you still have a long road ahead. Wall sheathing and roofing are necessary to protect all work that will come after. Wall sheathing panels, usually OSB, are installed quickly and typically are covered with house wrap on the outside of the panels. As the house is completely roofed, the project appears to be moving ahead at a fast pace. New windows and doors are installed. Like the roof and exterior walls, they further button up the structure and keep it weathertight for subsequent work. Construction pros describe the building as being "dried-in" after this stage, meaning the interior is protected from the elements. Crucial services, like electrical, plumbing, and heating/cooling are "roughed-in," meaning the behind-the-scenes elements like pipes, wiring, and ductwork are installed. It is normal for the project to appear to slow down when electricians, plumbers, and HVAC technicians come in, but these trades tend to work fairly rapidly. The actual snags tend to be associated with waiting for city inspectors to inspect and approve the work. With the addition of insulation and drywall, the project is beginning to look like a real structure. Insulation may be one or more of many different types, from standard fiberglass batts to sprayed foam to blown-in cellulose. Drywall is a multi-stage process: hanging the sheets, "mudding" the seams with wet drywall compound, letting that compound dry, and then sanding the seams. Flooring and cabinetry are installed, and ceilings and walls are painted. Flooring might be installed before paint is applied, or paint may come first. Usually, it is a toss-up as to which is the more effective method (in terms of cleanliness), so this is often dictated by scheduling. Painting contractors are experienced at painting cleanly after finish flooring has been installed. The carpenters come in and put up detailed trim work such as baseboards, window trim, crown molding, and so on. Doors are hung. Plumbers, electricians, and HVAC installers put in their fixtures and equipment and make the final service connections. However, some of this work, like setting up heat and water supply for the building, may be done before the interior is finished. A punch list is a record of the miscellaneous items left to be done. Many of these are finishing touches that had to wait for other work or were simply missed in the process. Often, both the contractor and the homeowners compile their own lists and combine them into a master checklist.